Having a child with special medical needs can be incredibly challenging. You love your child with all of your heart, but the time and emotional energy you spend caring for the child can be draining. It is also confusing as there are times that you get angry about your circumstances, then feel guilty about feeling that way about your child. It is also incredibly expensive. Even with a great health insurance policy, co-pays and unforeseen medical expenses quickly add up. That is why it is incredibly important to account for these expenses when parents are separated. When parents are separated, it is extremely important for parents to continue to work together to ensure that the child’s medical needs are met. This can be accomplished by an agreement between parents, which specifically addresses the child’s health insurance and all medical-related expenses. Establishing these financial expectations provides stability for the child and can lessen the anxiety that both parents experience. Of course, parents are not always able to agree to child support terms. That is when parents find it necessary to obtain court-ordered child support or to modify an existing obligation. In North Carolina, child support is generally determined by formula, which accounts for the parents’ incomes and expenses, as well as the child’s expenses. Courts also consider a child’s medical expenses. There are times when children have extreme medical needs and expenses that challenge the child support formula and guidelines. There is an incredible range of medical needs that parents must attend to and pay for. In addition to health insurance premiums, there are copays, prescriptions, medical supplies and equipment, home health care expenses. There are also unforeseen expenses, like medical claims and that are denied by the child’s health insurance. If one parent has the child on their health insurance plan, the court will almost always order that parent to keep the child on their policy. This is especially true and significant for a child with medical needs, as it will be incredibly challenging to find a reasonably priced health insurance policy for a child with extreme pre-existing conditions. For the additional medical expenses, courts will consider numerous factors, including the nature of the child’s condition, estimates of medical expenses, and both parents’ incomes when determining how these expenses will be divided. If you are seeking child support, it is important to obtain records and bills to demonstrate the child’s high level of expenses for the court when it makes its child support order. 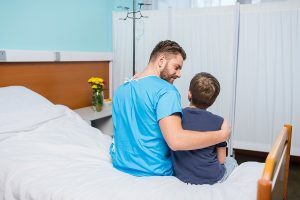 In addition, in some circumstances, the custodial parent may be unable to work because they must dedicate all of their time to the medical care of their child. The court should consider all of this information when entering its order. There are children whose needs and expenses far exceed the norm. If you have a child with medical needs, you are living this experience. New Direction Family Law understands that your child needs financial support and will fight for your ability to take care of your child’s needs. For more than twenty years, we have assisted clients in North Carolina custody and child support disputes. Take advantage of our experience. Call our team today at (919) 719-3470 to schedule a consultation, or contact us online at our website.